This technology is poised to deliver cost benefits and advance innovation in manufacturing, and companies will have to focus on replacing old protocols relying on extensive up-front testing and validation of traditional production tools, and understand steps needed to satisfy their quality requirements in the future, describes a new McKinsey report. Systems for additive manufacturing, or 3-D printing as it is better known, represent just a fraction of the $70 billion traditional machine-tool market worldwide. Yet given the likelihood that this technology will start to realize its promise over the next five to ten years, many leading companies seem surprisingly unaware of its potential—and poorly organized to reap the benefits, write authors Daniel Cohen, Katy George, and Colin Shaw, of leading strategic consulting company McKinsey. 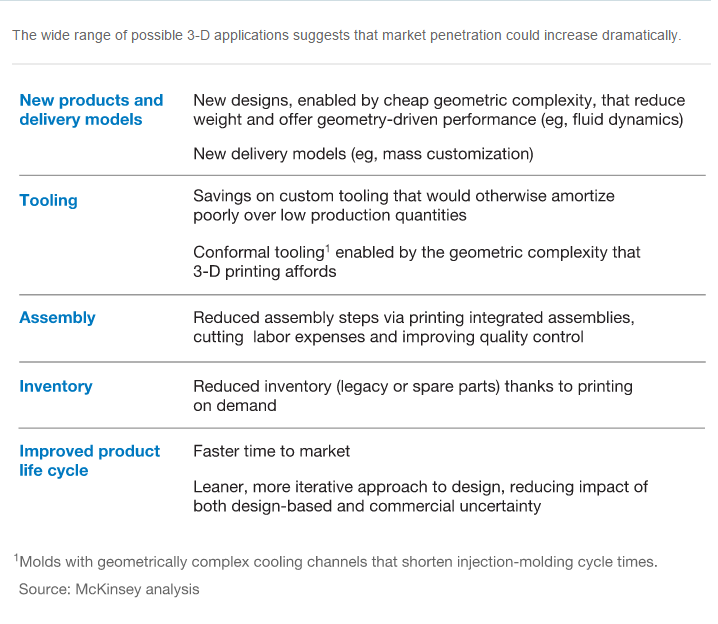 10 percent of the executives already find the technology “highly relevant,” and see 3-D printing’s ability to increase geometric complexity and reduce time to market as the key business benefits, closely followed by reduced tooling and assembly costs. Much will depend on when and how quickly overall printing costs fall, write the authors, which can help bridge the gap between cost of new and traditional manufacturing methods. They add that while there have been false dawns before for 3-D printing as a whole, companies cannot afford to be complacent. That will be especially true if the expected benefits to innovation are not only magnified by cost reductions but also bring into scope whole new industries and product categories. The authors advise companies to build a group of executive champions within the engineering, quality, operations, and procurement units. 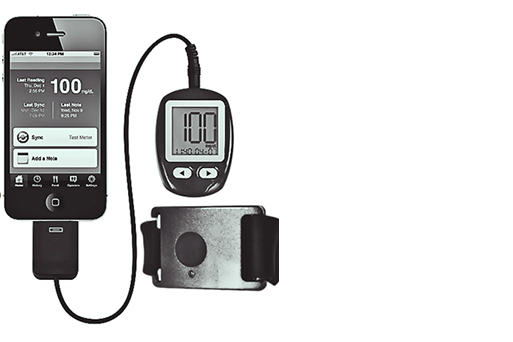 Some medical-device companies, for example, already have teams scanning their entire design portfolios for parts that could benefit from this technology. Furthermore, the introduction of 3-D printing into complex manufacturing environments would require big changes in quality-assurance and control processes: companies would have to replace old protocols relying on extensive up-front testing and validation of traditional production tools, such as molds. Since additive manufacturing reduces or even eliminates the need for these tools, organizations must understand the steps needed to satisfy their quality requirements in the future, the authors explain. Who’s Liable for 3-D Printed Medical Devices? As additive manufacturing comes to the forefront as a disruptive technology, industry continues to speculate about how liability will be shared.